vulne pro: Terran Trade Authority Roleplaying Game Now Available! 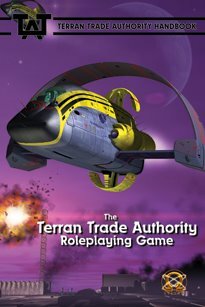 Terran Trade Authority Roleplaying Game Now Available! The Terran Trade Authority Roleplaying Game, based on the seminal million-selling future history series that began with Spacecraft 2000 to 2100 AD, authored by Stewart Cowley and recently updated and re-issued by Morrigan Press, is now available! Featuring a cover by, and reprints of, Adrian Mann's art from the updated Spacecraft 2100 to 2200 AD PLUS extensive interior art by Vulne Pro Studios's Mike Majestic and associated artists Karl Ostlund and Jainai Jeffries and with about half of the interior material written by Vulne Pro's Jeff Lilly, it looks as good as it plays. The TTA RPG is over 400 pages of new background information, ship stats, and complete RPG rules based on Morrigan’s critically acclaimed Omni System. The TTA RPG gives a solid, fleshed-out stage on which to base your TTA campaigns while retaining the air of mystery and wonder that made the original books into the SF icons that they are. Star system backgrounds, complete lists of skills, quirks, and equipment, rules for spacecraft flight and combat, short vignettes, the first look at the mysterious Alphans and Proximans and their cultures, and much more… all content has been reviewed and approved by Stewart Cowley himself. The TTA RPG is available now in downloadable PDF format from DriveThruRPG.com and soon in print format exclusively from Amazon.com and direct from Morrigan Press Inc. The PDF sells for $18 and the print version has a cover price of $29.99. The print version should be available in early to mid-November... I'll keep you all posted.